Empty Bowls is an international project to fight hunger, personalized by artists and art organizations on a community level. Join us TOMORROW, April 13th, at the Main Library at Goodwood for this unique fundraising effort! The floor will open at 11:30 AM, and you can get lunch and a beautiful handmade bowl until 1:00 PM. Presented by Baton Rouge Clinic, WVLA and FOX44, the event offers access to hundreds of handcrafted ceramic bowls from local Baton Rouge artists, followed by a simple meal. Tickets are $20, and include a delicious lunch, plus one ceramic bowl of your choosing. Additional bowls can be purchased at the event. 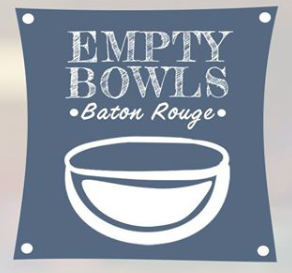 All proceeds from Empty Bowls will benefit the Greater Baton Rouge Food Bank. For more information, visit the Food Bank’s website.